1996 held at Dred Scott Playfield in Bloomington, Minnesota on August 31-September 1. 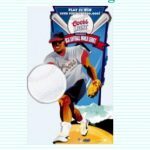 Home Run Leader – ? 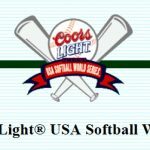 Coors Brewing Company teamed up with the ASA to create the Coors Light/USA Softball World Series – the first comprehensive, nationwide, slow-pitch Softball Championship. Amateur men’s Class-C and Class-D softball teams from across the United States will compete for the 1996 title. A series of local qualifying tournaments were held across the country, leading to 32 championships, with winners heading to eight regional playoffs, some played in local ballparks. The eight regional winners were then squared off for the World Series. The information about the 32 qualifying tournaments are nearly impossible to find. 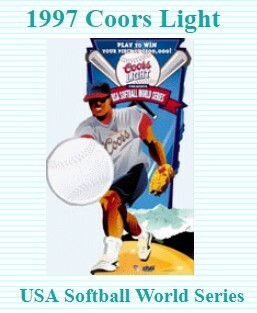 Coors Brewing Company teamed up with the ASA once again to create the Coors Light/USA Softball World Series. Any Amateur men’s Class-C and Class-D softball teams from across the United States will compete for the 1997 title. This year will be a little different. Each state will hold its own State Championship qualifying tournament. The state champion will then go to the World Series and compete with the other 49 State Champions. The information about all 50 State tournaments are nearly impossible to find. The (30) state championships that were found are listed here: 29 of these teams entered the tournament. The TPS Power Ratings are intended to reflect a team’s strength using the results from the four associations’ top levels of competition. Points are awarded on the basis of where a team places in any of the following regular and postseason events: USSSA Major NITs; ASA Super Qualifiers; NSA Class AAA Qualifiers, USSSA Class AA Championship; ASA Major Nationals; and NSA Class AA Championship. Points for tournament placements are: 1st–30; 2nd–20; 3rd–15; 4th–10; 5th–6; 7th–4; 9th–2. Six (6) points are awarded for each win over any Super team (identified by an asterisk * in front of the team’s name). Three (3) points are deducted (from any Super team) for any loss to a non-Super team. Points for placement and Super wins (Super losses will be deducted) will be awarded at triple value for each of the four post-season Grand Slam Championships; USSSA World Series, ASA Super Nationals, NSA World Series, and ISA Super Major World Series. In the case of an event being cancelled prior to its finish, points will be combined and divided amongst the teams sharing those positions in the event. In the event of ties and the end of the season, ties will be broken first by head-to-head play and secondly by overall won-loss records in these events. 1996 held at Eastwood Softball Complex in Tupelo, Mississippi on August 30-September 1. Utility – Steve Reagan, ROHR, Inc.
Second Base – Jeff Hopkins, ROHR, Inc.